A decorative building with Gothic mural paintings of saints on the ground floor, and Renaissance paintings and sgraffito on the facade. In 1576, the house was purchased by Gabriel de Blonde, one of the authors of the decorative paintings in the castle. 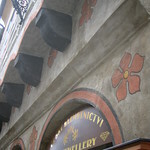 Noticeable paintings of five-petalled roses, the symbol of Rosenberg, on the facade means that the owner of the building was not a burgher but a person of significant importance to the castle. 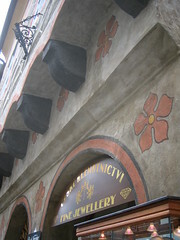 At the beginning of the 20th century, this building housed a cafe, of which Egon Schiele was a regular customer.